The U.N. Human Rights chief expressed concern Thursday that Sudanese security forces have used excessive force and live ammunition against anti-government demonstrators, and she called on Khartoum to allow citizens to peacefully protest. "A repressive response can only worsen grievances," High Commissioner for Human Rights Michelle Bachelet said in a statement from her office in Geneva. The country has seen large-scale demonstrations since Dec. 19, when the government raised bread prices. The protests have grown in scope, and many are calling for an end to the three-decade-long rule of President Omar Hassan al-Bashir. The government has confirmed that 24 people have died during the protests, but the U.N. says credible reports suggest the death toll may be nearly double that. There have also been numerous injuries and reports that security forces fired tear gas and bullets inside a hospital as they pursued injured protestes. "I also call on the authorities to ensure that all those arbitrarily detained for the exercise of their rights to freedom of peaceful assembly and expression are promptly released, and that these rights are fully protected," Bachelet said. "I urge the authorities to work to resolve this tense situation through dialogue, and call on all sides to refrain from the use of violence." She said she is ready to send a team to Sudan to advise authorities to help them meet their international human rights obligations. Meanwhile, at a U.N. Security Council meeting in New York about international sanctions imposed on Khartoum, Sudan's U.N. envoy Omer Dahab Fadl Mohamed raised the issue of the protests, saying his government is "fully committed" to giving citizens a space to peacefully express their views. 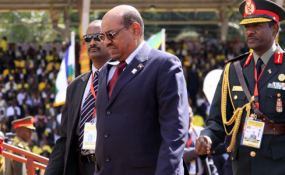 "At the same time, the government of Sudan is committed toward its constitutional duties as is guaranteed it by international law — its right to protect lives and public property against sabotage and arson, and all other forms of violence perpetrated by some demonstrators," Mohamed said. The U.S. envoy, Rodney Hunter, noted Washington's concerns, urging Khartoum to "fully respect" the rights to freedom of association and peaceful assembly, and to release all journalists, opposition leaders, activists and other arbitrarily detained protesters. Hunter also urged the government to ensure that an independent and transparent investigation be carried out into the deaths of protesters and for the use of excessive force.